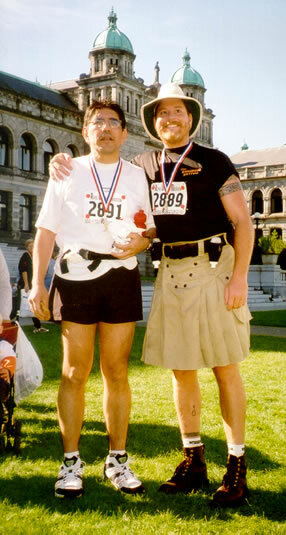 On the lawn of the British Columbia Legislature with David Seymour after we've completed the Marathon and received our medals. It was David's first marathon and my second. We ran a blistering pace of 4:42:10 and crossed the finished line together with the exact same time. I can guarantee you that I was the only one in the entire Marathon running in a Tilley hat, a Utilikilt and Dayton boots. Oh yeah, and a Vanishing Tattoo T-shirt of course! And to think that less than a week ago I was in Borneo.